That's a saving of £3 an hour!! My name is Phil. 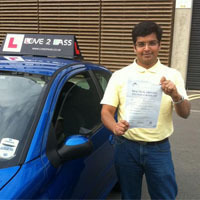 I am a driving instructor in Derby, offering fun and informative driving lessons in Allestree and Darley Abbey. I don't just teach in these areas, I cover all of Derby too. I teach people to drive in a Peugeot 206. So whether you've just turned 17 and are raring to go, or are older and feel the time has come to learn to drive, I can offer you informative, structured lessons providing you with the feedback you need to pass your test. Give me a call on 07753 905 291 to book your driving lessons.